Let us now praise both the unnamed builder and the architect of this elegant little Hooverville shack. They were almost certainly the same person: a single middle-aged man without means except those scrounged to build his tidy Great Depression home. At the front of our architect’s one room studio with attached kitchen is an ornamental front porch that makes a whimsical allusion to grandeur. The bathroom is unattached and away, resting on a short dock over Elliott Bay. Puget Sound squatting has a pioneer history. It begins with the earliest settlers –the Dennys, Terrys and Maples. While rationalizing their squatting as “making claims” they quickly built cabins and lean-toos on land that was not yet theirs by either treaty or outright conquest. These contradictions were later codified in 1865 – after the treaties - when the first municipal laws prohibited Indians from camping in the city. 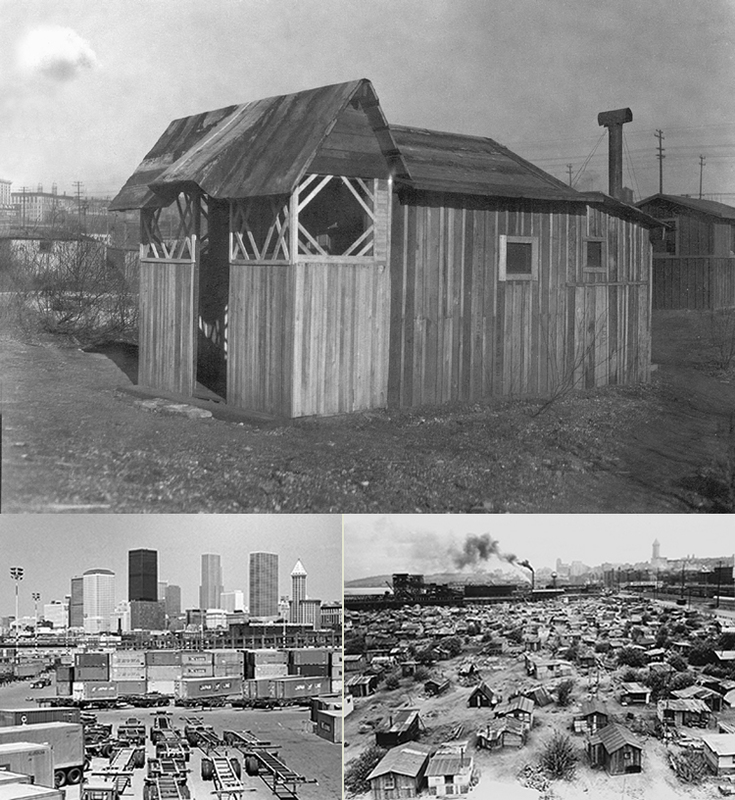 Hooverville also began in the winter of 1932 as a land-grab when a flying squad of down-and-out men fed up with the flop houses around Pioneer Square joined to hastily raise their shack town from materials that were just lying around. One week later and on schedule the city acted on its threat and burned the shantytown down. But these men and many more just as quickly returned and built a mixed-race community that policed itself and eventually working with city officials tidied itself for curious visitors and the postman. One regulation required two windows in every home – as here. The beginning of Hooverville mobilization began nearly two years before Pearl Harbor when after eight years this sprawl of small shanties was torched again -- this time without much complaint or resistance. Many of the single men got jobs helping build war ships near where they once lived.